President Barack Obama’s climate regulations, to be unveiled Monday, are becoming a partisan political issue on the 2016 presidential trail, with Republican candidates lining up to oppose them and Democratic contenders coming out in support. The set of rules, called the Clean Power Plan, could elevate climate change in the upcoming presidential election after years in which few voters considered it a top issue. The final Environmental Protection Agency rules will cut carbon emissions from the nation’s power plants 32% by 2030, based on emissions levels from 2005. The Obama administration says the rule will help propel action to address climate change on a global level, while Americans’ electricity bills will go down by 2030. GOP candidates for president disagree, arguing that domestic energy prices will skyrocket in return for negligible reductions in global carbon emissions. The next occupant of the Oval Office could have more power over Mr. Obama’s legacy on this issue than the current president himself. While Mr. Obama’s EPA is issuing the final rules, it will be up to the next president to implement them — or freeze or undo them. States have until 2018 to submit plans to EPA on how they propose to cut their emissions, and those plans don’t go into effect until 2022. The Democratic candidates sought to frame the debate over the EPA regulations in the context of the urgency of climate change, while the GOP contenders instead raised concerns about energy costs and jobs. 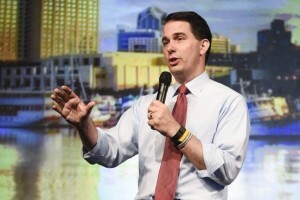 “President Obama’s plan should be called the Costly Power Plan because it will cost hard-working Americans jobs and raise their energy rates,” said Wisconsin Gov. Scott Walker, a presidential candidate and one of a handful of GOP governors who have said they won’t submit a plan to comply with the rule. In 2011, Mr. Christie pulled his state out of New England’s market-based trading system to cut carbon emissions, arguing then that it was ineffective in cutting carbon emissions. Candidates for the Democratic nomination praised the rules as being good for both the planet and the U.S. economy. “It’s a good plan, and as president, I’d defend it,” said former Secretary of State Hillary Clinton.